Aggadah (Aramaic אַגָּדָה: "tales, lore"; pl. aggadot or (Ashkenazi) aggados; also known as aggad or aggadh or agâdâ) refers to non-legalistic exegetical texts in the classical rabbinic literature of Judaism, particularly as recorded in the Talmud and Midrash. In general, Aggadah is a compendium of rabbinic texts that incorporates folklore, historical anecdotes, moral exhortations, and practical advice in various spheres, from business to medicine. In terms of etymology, the cognate Hebrew: הַגָּדָה‎, means "telling", while the Aramaic root אגד (as well as נגד from which אגדה may arise) has the dual implication of “expanding” / “drawing out” and “binding” / “drawing in”. Correspondingly, the Aggadah may be seen as those teachings which communicate Rabbinic traditions to the reader, simultaneously expanding their understanding of the text, while strengthening their religious experience and spiritual connection. The root also has the meaning "flow", and here relates to the transmission of ideas. 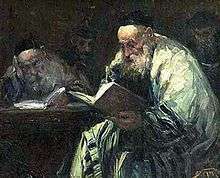 The Aggadah is part of Judaism's Oral law (תורה שבעל פה‎)—the traditions providing the authoritative interpretation of the Written Law. In this context, the widely held view in rabbinic literature is that the aggadah is in fact a medium for the transmission of fundamental teachings (Homiletic Sayings—מאמרים לימודיים‎) or for explanations of verses in the Tanakh (Exegetic Sayings—מאמרים ביאוריים‎). In Rabbinic thought, therefore, much of the Aggadah is understood as containing a hidden, allegorical dimension, in addition to its overt, literal sense. In general, where a literal interpretation contradicts rationality, the Rabbis seek an allegorical explanation: "We are told to use our common sense to decide whether an aggada is to be taken literally or not" (Carmell, 2005). Rabbi Moshe Chaim Luzzatto, the Ramchal, discusses this two-tiered, literal-allegorical mode of transmission of the Aggadah in his well known Discourse on the Haggadot. He explains that the Oral Law, in fact, comprises two components: the legal component (חלק המצוות‎), discussing the mitzvot and halakha; and "the secret" component (חלק הסודות‎), discussing the deeper teachings. The aggadah, along with the Kabbalah, falls under the latter. The rabbis of the Mishnaic era believed that it would be dangerous to record the deeper teachings in explicit, mishnah-like, medium. Rather, they would be conveyed in a "concealed mode" and via "paradoxes". (Due to their value, these teachings should not become accessible to those "of bad character" and due to their depth they should not be made available to those "not schooled in the ways of analysis".) This mode of the transmission was nevertheless based on consistent rules and principles such that those "equipped with the keys" would be able to unlock their meaning; to others they would appear as non-rational or fantastic. In line with the above, Shmuel ha-Nagid, in his "Introduction to the Talmud", states that "Aggadah comprises any comment occurring in the Talmud on any topic which is not a commandment (i.e. which is not halachic) and one should derive from it only that which is reasonable." As regards this, Maimonides, in his preface to the tenth chapter of Tractate Sanhedrin (Perek Chelek), describes three possible approaches to the interpretation of the Aggadah. Sefer Ha-Aggadah (The Book of Legends) is a classic compilation of aggadah from the Mishnah, the two Talmuds and the Midrash literature. It was edited by Hayim Nahman Bialik and Yehoshua Hana Ravnitzky. Bialik and Ravnitzky worked for three years to compile a comprehensive and representative overview of aggadah. When they found the same aggadah in multiple versions, from multiple sources, they usually selected the later form, the one found in the Babylonian Talmud. However, they also presented some aggadot sequentially, giving the early form from the Jerusalem Talmud, and later versions from the Babylonian Talmud, and from a classic midrash compilation. In each case every aggadah is given with its original source. In their original edition, they translated the Aramaic aggadot into modern Hebrew. Sefer Ha-Aggadah was first published in 1908-11 in Odessa, Russia, then reprinted numerous times in Israel. In 1992 it was translated into English as The Book of Legends, by William G. Braude. ↑ See corresponding entries in Marcus Jastrow: A Dictionary of the Targumim, the Talmud Babli and Yerushalmi, and the Midrashic Literature. ↑ See Rabbi Moshe Weissman, The Midrash Says (Benei Yakov Publications, 1980), introduction to Volume 1. ↑ See Daniel 7:10 and Rashi ad loc (Hebrew orig., English transl.). ↑ See Rabbi Nathan Cardozo, The Infinite Chain: Torah, Masorah, and Man, ch. 6. ↑ Marjorie Lehman (1999). The Ein ya'aqov: A Collection of Aggadah in Transition. Prooftexts, Vol. 19, 1999. ↑ According to Peninnah Schram, "Dov Noy is the fourth major figure in the renaissance of preserving and perpetuating the Jewish oral tradition. While he has published many books and important essays (including the entry "Folklore" in The Encyclopaedia Judaica), his two main contributions are: 1) he applied an international classification system to Jewish traditional narrative; and 2) he established the Israel Folktale Archives"